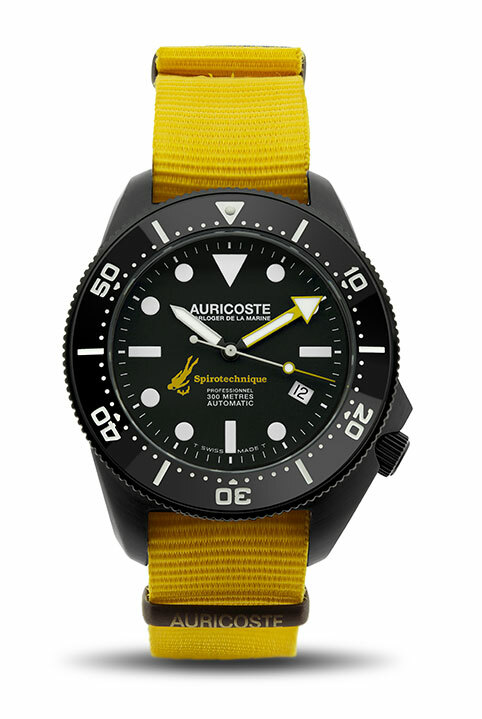 The Spirotechnique is back with Auricoste for a new submarine adventure. 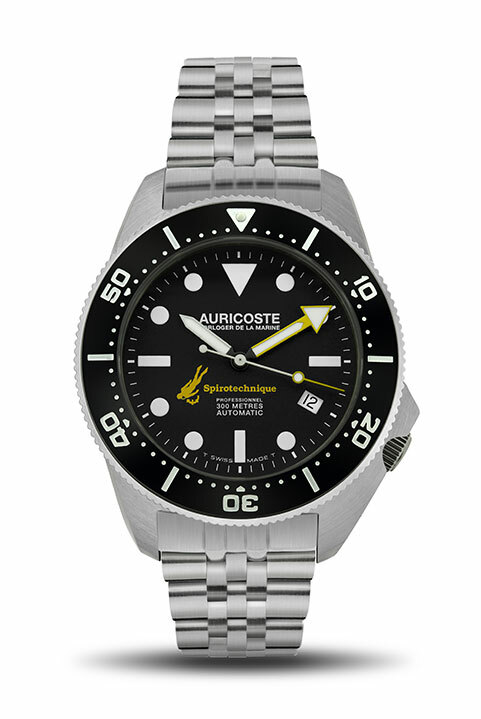 Modified to 300 meters, this diving tool is manufactured for both professional divers and diving enthusisasts. This new Spirotechnique watch is an evolution of our model of the 80’s. An evolution from 200m to 300m waterproof, bigger protection of the crown and sapphir glass. 41mm diameter (excluded crown) for the 316L brushed steel case. Available in four versions: index dial, numbers dial, brushed steel or PVD/DLC (both models). 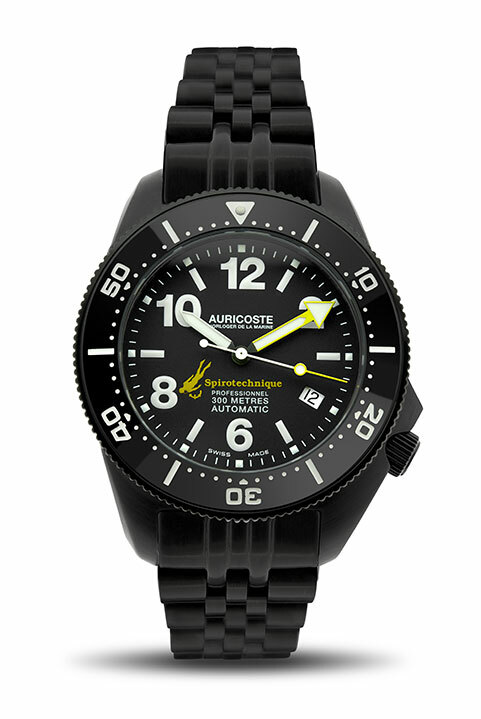 Straps: rubber, Auricoste’s nato or steel. ETA 2824-2 with dato to 4 h. – Automatic ball bearing winding mechanism. – Corrector, numerical order – Second stop device – Raquetterie Etachron et raquette corrector – 28.800 a/h ; 4hz. 25 rubis. 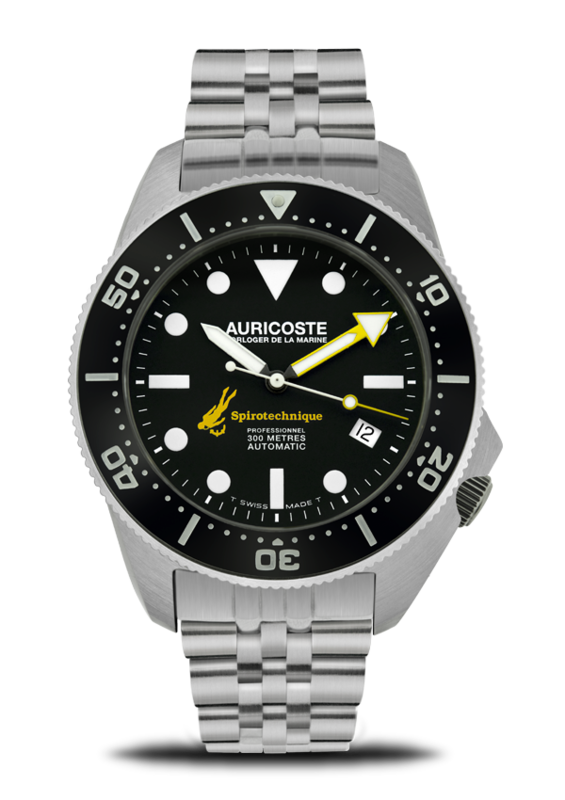 Brushed stainless steel 316 L or Black OVD/LDCCarbon finishing depending on the versions – Diameter : 42 mm – 60 minutes unidirectional rotating bezel, “IceBlack” machining. 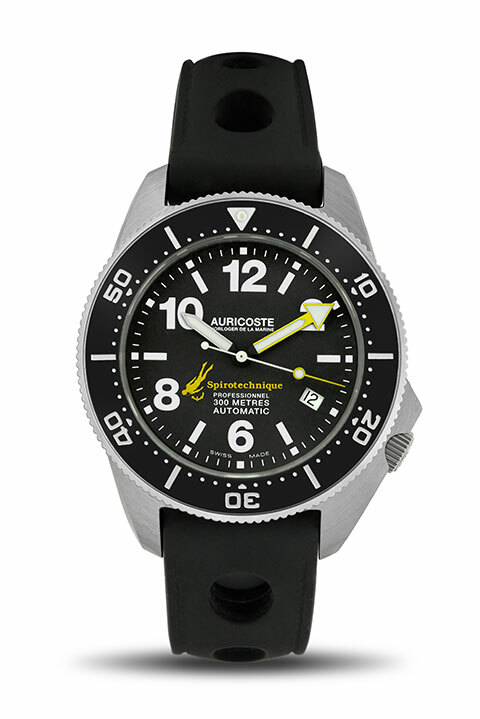 Substance treated Super Mat Black – Hour markers and hands covered – Swiss and white Super-LumiNova® numbers – Photo luminescent Blue Line BG W9 – Waterproofness 300 m.
Delivered with 3 diving collector bracelets: Nato original nylon and Hypoallergenic natural rubber. (black, yellow, dark blue, grey or red).